Elfego Baca (1865-1945) – Socorro County, New Mexico lawman, attorney, and U.S. Deputy Marshal. Mitchell Bader – U.S. Deputy Marshal commissioned in the Western District of Arkansas in 1892, by Marshal Jacob Yoes. J. Baer – U.S. Deputy Marshal and Court Crier in the Western District at Fort Smith, Arkansas. William “Billy” Bailey, aka: Bill Wilson, William Baylor (18? ?-1871) – A lawman and cowboy, Bailey was working in Newton, Kansas when he was killed by Mike McCluskie, which prompted the famous Hyde Park Gunfight. Wood E. Bailey – U.S. Deputy Marshal commissioned in the Western District at Fort Smith, Arkansas, by Marshal Jacob Yoes. Charles Baird – U.S. Deputy Marshal commissioned in the Central District by Marshal J. J. McAlester in June, 1895. P.C. Baird (18? 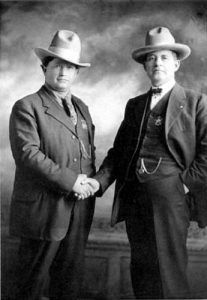 ?-1928) – Mason County, Texas Sheriff and Texas Ranger. Allen Baker – U.S. Deputy Marshal commission on October 1, 1894 for the Northern District of Indian Territory . A.R. Baker – A lawman, served as a Texas Ranger under Captain Frank Johnson in 1906. 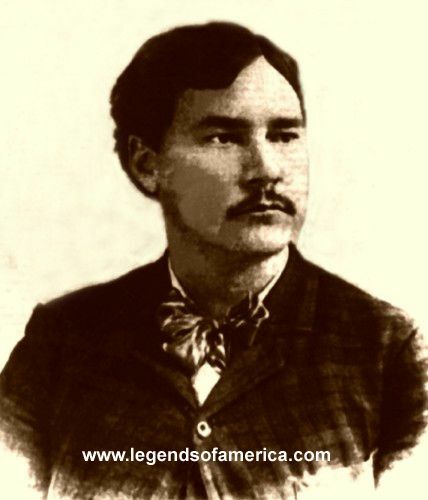 Benjamin F. Baker – U.S. Deputy Marshal in Arizona Territory commissioned on April 8, 1882. Frank Baker (18? ?-1878) – An outlaw member of the Jesse Evans Gang and a lawman, Baker was involved in the Lincoln County War and was killed by Billy the Kid on March 10, 1878. Isaac Baker – U.S. Deputy Marshal commissioned on July 9, 1869 under Marshal William A. Britton of the District Court in Van Buren, Arkansas. J.H. Baker – A lawman, Baker served in Company C of the Texas Rangers around 1907. James Baker – U.S. Deputy Marshal commissioned in the Western District of Arkansas in 1897 by Marshal Solomon F. Stahl. John Baker – U.S. Deputy Marshal commissioned in the Western District at Fort Smith, Arkansas. William Baker – U.S. Deputy Marshal commissioned in the Western District of Arkansas on October 1, 1894, by Marshal George C. Crump. William Bales – U.S. Deputy Marshal commissioned in the Southern District Court of Indian Territory at Paris, Texas in 1894 by Marshal Shelby Williams. Andrew “Andy” W. Balfour (or Belfour) (18? ?-1891) – A Deputy Sheriff in Kiowa County, Kansas, Balfour was tracking Zip Wyatt, who had shot up the town of Mulhall, Oklahoma in June, 1891. Having wounded two citizens, and with a warrant out for his arrest, Wyatt fled to Kansas, where he stole some riding gear in Greensburg, in Kiowa County in July. Balfour tracked Wyatt to Pryor’s Grove about ten miles north of Greensburg, where he attempted to arrest the fugitive, only to be shot in the abdomen, with the bullet striking the officer in the spine and killing him. However, the deputy rallied before he died, shooting Wyatt twice, but only wounding him slightly in the hand and on his left side. Deputy Sheriff Balfour left a wife and six children. In the meantime, Wyatt escaped to return to Oklahoma, formed a gang, and terrorize the territory for the next several years. He was finally captured after a gunfight, in which he was wounded, and died in jail in Enid, Oklahoma. William Ball – U.S. Deputy Marshal commissioned in the Western District at Fort Smith, Arkansas under Marshal Jacob Yoes on April 13, 1892. Charles Ballard – A deputy marshal in Roswell, New Mexico. William Ballard – U.S. Deputy Marshal working in Muskogee County, Oklahoma. David Monticello “Bud” Ballew (1877-1922) – A noted gunfighter and lawman. After killing a number of men, he was shot down by Wichita Falls, Texas Police Chief on May 5, 1922. William “Bill” Dudley Banks – U.S. Deputy Marshal commissioned in Oklahoma Territory and assigned by Marshal Evett Nix to the Cheyenne District on July 15, 1893. In 1894, Deputy Bank rode with Heck Thomas, Bill Tilghman and Chris Madsen to try to apprehend the Bill Doolin Gang, but were unsuccessful. In February of 1895, Banks rode with several other deputies in pursuit of outlaws, Jim Harbolt and Dan McKenzie, who were charged in the murder of Canadian, Texas Sheriff Tom McGee who was killed on November 24, 1894, during a robbery. Banks and the other marshals were successful in apprehending the two outlaws. After the Doolin Gang robbed the Rock island train at Dover, Oklahoma, Banks and other officers pursued them once again. The officers caught up with the gang about 30 miles west of Hennessey, Oklahoma where a gunfight erupted. In the melee, Banks killed outlaw “Tulsa Jack” Blake and collected the reward. The following year, in July, 1895, Banks, along with numerous lawmen from various jurisdictions participated in the manhunt for notorious outlaws, Zip Wyatt and Ike Black. In July, 1898, Banks was riding with U.S. Deputy Marshals Alberty and Dobson when they killed Bill Nail of the Moose Miller Gang. Benjamin Gray Barbee (1871-1943) – U.S. Deputy Marshal in Oklahoma Territory.W.H. Barbee – U.S. Deputy Marshal commissioned in the Western District at Fort Smith, Arkansas by Marshal George C. Crump. W.H. Barbee – U.S. Deputy Marshal commissioned in the Western District at Fort Smith, Arkansas on December 14, 1891 by Marshal Jacob Yoes. By 1895, Barbee was living at Braggs, Oklahoma. In April, 1895, outlaws Sam “Verdigris Kid” McWilliams, George Sanders and Sam Butler, who were wanted for robbery and murder, rode into town ordering everyone to put up their hands. The trio of outlaws quickly marched their prisoners Madden General Store and when the store clerk panicked and ran into the street, the outlaws shot him down. As their hostages stood waiting, the thieves robbed the general store and exchanged their clothing and boots for new ones. One of the hostages was then sent to bring a horse to the store, exchanging it for one of theirs. Fortunately, the owner of the store was not present but could see the robbery taking place and quickly reported it to two law officers, one of which was U.S. Deputy Marshal Barbee. When the two officers arrived, they shot the Verdigris Kid and Deputy Marshal Barbee opened fire on the rest of the gang. George Sanders was also killed, and Sam Butler, though wounded, escaped. L.E. Barbey – U.S. Deputy Marshal in Arizona Territory commissioned on February 1, 1882.